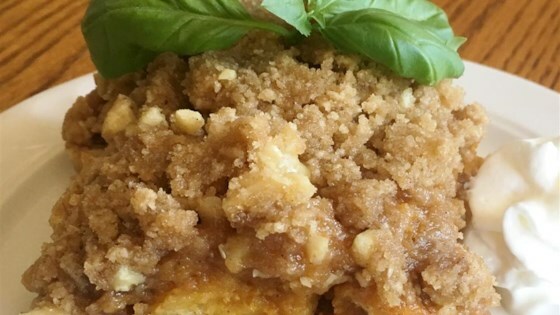 "This is a fantastic dish to make in the fall, especially for the holidays." Place bread cubes in a bowl. Cover and let stand until stale, 8 hours to overnight. Preheat oven to 350 degrees F (175 degrees C). Grease a 7x11-inch baking dish with cooking spray. Whisk pumpkin puree, eggs, milk, 1/2 cup melted butter, white sugar, 1/2 cup brown sugar, maple syrup, pumpkin pie spice, vanilla extract, and salt together in a large bowl. Add bread cubes a few at a time, folding until mixture is moist but not soupy. Pour into the baking dish. Combine flour, 3/4 cup brown sugar, 1/2 cup butter, and cinnamon in a bowl; crumble together with your fingers. Stir in walnuts; sprinkle over the baking dish. Bake in the preheated oven until center is set and crumb topping is golden brown, about 1 hour. You may not need all the bread in step 3. Substitute pecans for walnuts if desired. This tasted better the longer in sat. I actually dried out my bread cubes in the oven since I forgot to let them sit over night. Easy and quick to make. I wasn't sure about crumb topping on bread pudding but it was good! it was a little dry but I'll adjust to less bread next time. It's really great warmed and with icecream!